Rain guns will be used at agricultural fields when its soil suffers moisture stress. As Isro predicted no rainfall during August and September, the state government intends to encourage farmers to cultivate dry crops like maize, corn and other varieties by availing of the services of rain guns, especially in four districts in Rayalaseema region, Prakasam and upland areas in Krishna and Guntur districts in the state during the present kharif Season. As part of drought mitigation plan, the state government has acquired 13,334 rain guns and positioned them in districts and they are geo-tagged. Similarly, farm lands, where dry farming is required, are also geo-tagged. Multi-purpose extension officers will be visiting the farm lands and record the soil moisture content at periodical intervals and post such information online. A click on the software application, which works on android-supported smart phone, will display the location of rain guns and farm lands having less moisture content similar on the lines of how software application of Uber cabs display the location of cabs in a metro city, whenever a passenger clicks on its app. Whenever a farm land suffers moisture stress based on the online recordings of an MPEO, the agriculture officer concerned will get an alert on his mobile phone who, in turn, informs the farmer concerned and other officials of the need to avail the services of rain guns to cultivate ID crops. The base unit of the high-tech agriculture tool comprises two rain guns, two sprinklers and a water carrying pipe. When a farmer intends to avail the services of rain guns due to less moisture content in his farmland to cultivate an ID crop, he has to click On the software application. As his details of farm land with geo-coordinates are already fed in the software application, an alert will be sent to the agriculture officials concerned indicating the availability of nearby rain guns to be shifted to the farmland. Accordingly, the rain guns will be placed in the farmland concerned. 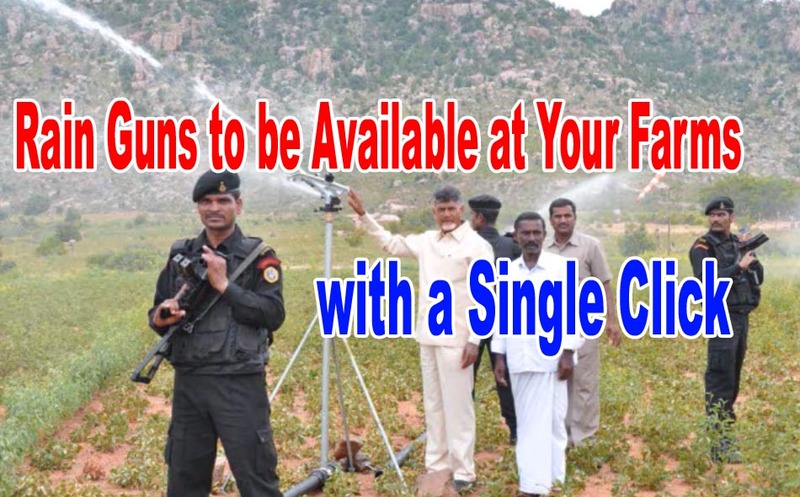 No charge will be levied on the farmer for availing the services of rain guns. However, the farmer has to pay 50% of the cost for drawing the water from the nearby source or for its transportation, if no source of water is available in the vicinity.